From all of Professor Hofstede cultural dimensions, I find this the most difficult one to explain to people not familiar with this dimension. Reason being is that most people seem to associate this fourth of Hofstede cultural dimensions with only formal rules and not with the many more informal rules that a society has. 5 Risk or no Risk? With this, we’ve answered the question What is Uncertainty Avoidance. However, to a lot of people, this is just an academic definition. When it comes to Hofstede cultural dimensions, the other three are easier, better defined (I’m talking about Power Distance, Individualism, and Masculinity). There’s a saying that says that the only two things that are absolutely certain are death and taxes. About the rest, we cannot be sure. Now, there are some countries that look at this and say: “fine, that’s all I need to know. I’ll cross that bridge when I come to it.” These countries will score relatively low on this dimension. There are also countries that say: “if the only things certain in life are death and taxes, I need more predictability; I want to know what is around the curve“. These countries will score relatively high on this Hofstede cultural dimension. Given the above, there are three problems with this dimension, which add to the complexity of really understanding it. Everyone, irrespective of where they come from, thinks that there are a lot of rules in their country. This is a very subjective viewpoint. Objectively there are vast differences in the amount of rules a country has. The second issue is that most rules that we have are not the formal rules that we think of at first. The maximum speed limit is a formal rule. How we meet and greet is not a formal rule, but it is a rule. The last issue is that countries that score high might not always follow the rules that need to be followed. There are simply too many rules, and the individual could choose the rule that fits his current situation best. My experience is that Western Europeans and North Americans view Mediterranean countries as quite relaxed and therefore low scoring on this dimension. Whilst the opposite is true. Mediterranean countries all high uncertainty avoidance countries. The same perception holds true for Western Europeans and North Americans, judging/guessing if a country scores high or low on this dimension if their perception of that country is somewhat chaotic. So if the perception of someone from the West is that the country is chaotic, then their score cannot be high uncertainty avoidance. So if the perception of someone from the West is that the “other” country is chaotic and/or not very organized, they will interpret that as being a low scoring country; it’s chaotic and unorganized, hence there must be little rules, right? But the opposite is often true. Countries that may look disorganized from the outside usually do (!) have a lot of rules. Countries that score high on uncertainty avoidance even have so many rules that the people do not know what rules to stick to (because there are so many), so they pick and choose the rules that make the most sense to them at that moment. And just to make sure, I’m talking about official rules. Below are some high uncertainty avoidance characteristics. Structure, rules, expertise: makes sense too, right? But not only formal rules (like the maximum speed on the freeway, but also informal rules like how do you properly pour a glass of wine and taste it). Security (avoiding the unfamiliar): rather than taking risks, people prefer that what they know already. Hectic: “life” is being perceived as hectic and stress full. Pretty much from all angles. Emotions/passion: showing your emotions is seen as a way to blow off steam. Consider a minor car collision in Rome (high scoring) versus London (low scoring). See that it says “Structure, rules, expertise” under high uncertainty avoidance cultures? The thing is that cultures that have a relatively high score on this dimension do have a lot of rules and regulations. But… they don’t always stick to those rules (depending on other cultural factors). Few rules, little structure: makes sense, right? Entrepreneurial: starting your own business is seen as very normal; the same goes for risk taking (no guts, no glory!). Stress-free: people experience “life” as being relatively stress-free. Cool, calm & collected: there is a premium in society to look Cool, Calm & Collected. Think of the British stiff upper lip. If you’re only interested in getting some uncertainty avoidance examples, make sure to read this article (opens in a new window). Low uncertainty avoidance cultures are generally higher risk takers than high scoring countries. Examples are the credit crisis that started in the US (a relatively low scoring country). Versus Belgium a (very) high scoring culture where the level of risk involved in mortgages is pretty much zero. I hope that with this explanation of what is uncertainty avoidance, I was able to shed some light on the most difficult of Hofstede cultural dimensions. It’s exclusively available in the Amazon Kindle store. Click here to go there now. 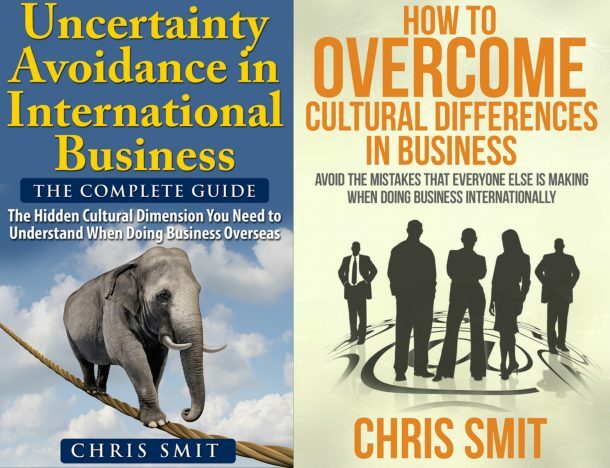 Do you have questions about what is uncertainty avoidance or anything about culture? Let us know in the comments section below. I understand it to be related to resilience (without value attached here!) in the face of stressful factors, or at a time when flexibility and “out-of-the-box-thinking” is needed. As in, cultures with higher uncertainty avoidance indeces would prefer to avoid that which is not per se predictable — since it would be considered to be a source of stress (rather than of creativity, etc.). Thanks for your persistance in getting your comment in! Or take a look into other ideas about cultural differences: Rosinski’s Coaching across Cultures is another approch to understand Culture. Thanks for your comment and example. The Belgians. Our almost solve the economic crisis by themselves. I think the dimension is very personal as well, about how people feel/ react in unknown situations. Also, how much do we trust people? At the same time, the more rules there are, the less respect there is for these rules (just another one). Countries with high UAI accept all the new directives from the EU, whereas a country like GB is always “against”: they say “do we need another law/ rule? Even if we don’t respect rules, we still have a psychological need for them. Take the example of speed limits: oh yes, of course we should heve them, but that doesn’t mean we respect them! History probably explains why the scores are high in some cultures (Latin cultures), but at the same time it is very very individual. A good example is also: do we need to carry an identity card with us at all times? Why? this correlates with UAI. I think if you ask any one from any Country/Culture they will confirm that their Culture has a lot of rules. This is never objective. In comparing them you can see the difference (like your example with carrying an ID card). In Belgium one has to prove relevant business understand before being allowed to start a business as a sole trader without limited liability. – passing an examination administered by the state. – having a family member proxy for you who has experience ( e.g sibling or spouse. ) who satisfies the earlier criteria. Starting a limited company one needs a degree and have to inject a minimum paid up capital of EUR18,550 (SPRL), while a joint-stock corporation (SA) requires EUR65,550. Why is this? Reducing risk. Compare this to the anglosphere. I think uncertainty avoidance has deep roots in biology, i.e. : in our DNA. Humans are perhaps the most timid of all the primates and we’ve been successful and survived because we’ve leveraged that into audacity, group protection, problem-solving for difficult environments and other strategic behaviors, due to the inherited limbic system. We also have great cultural development, cultural variety and cultural success because we are so un-instinctual; i.e. : we learn to control our responses despite our limbic systems. The whole stupid nature/nurture debate is a bit of Occidental cultural Manichaeanism: our cultures allow us to negotiate a balance of both. I for one am a mostly introverted person who has taken risks in part because of my Anglo-American cultural upbringing (and many people thus think i’m an extravert) and prefer the sense of certainty of life in Latin America, because of my personality AND my latino heritage. Or is it a rich mix of all of those? I am not ever 100% in agreement with Geert’s analysis of his research (i even question the validity of his research, its inherent biases and mis-uses) but i think this part of his studies merits a lot richer analysis and a subtle, nuanced interpretation of what “rules” (defined as that which can be broken; e.g. : we don’t make rules about obeying gravity — it’s the law.) are, how they function, how they interact with contrasting myths and norms and values of a culture. It’s much too complex ever to put into either/or predictions. It’s part of the managerial culture’s desire to reduce uncertainty that they want us to produce trainings that will give clear, fixed, totally predictable answers about that great unknown, the individual (whether employee, customer, or boss). PS: BTW, i think of the USA as a society that has moved greatly toward higher intolerance of uncertainty. People are becoming much more rigid, timid in their willingness to risk their true values and their comforts, polarized in their opinions and unwilling to risk compromise, expecting things to reward them as planned and unable to respond with resilience when 2008 happens, more conformist in self-expression. This of course is reflected by even greater anti-authoritarian youth movements (Goths and the whole gamer culture as well as extreme “sports”), more opportunity for risk-taking entrepreneurial types and bigger non-juridical punishments for those who overstep the bounds (and don’t make $1000000). People’s self-perception is often 180 degrees different from what the mirror would show them. My understanding of ‘Uncertainty Avoidance’ = is this a ‘prevention is better than cure’ culture? or is it a ‘go for it!’ culture? Yes, there may be an individual/personal factor involved; however, from an anthropological/sociological point of view this dimension is similar to the ‘control nature v nature controls’ dimension (Fons Ttrompenaars Internal v External Control). Cultures that score high on UA tend to have, what I call, an ‘engineer’s mindset’ and are long-term thinkers. There are exceptions, of course, but it is about the extent to which risk-taking and flexibility are acceptable. Styles of entrpreneurship are amrked by this. Where I live (Barcelona) the local Catalans are much longer-term thinkers and more engineer-like culturally than the Spanish (with the exception ot the Basques and those groups that belong to the ‘Catalan mentality’). NZ, on the other hand is very much about ‘go for it’, ‘mend as you go’ and entrepreneurship; it is the result of its history. Of course another result of NZ’s history is the desire for social justice and this is what had led to many innovative, long-term thinking policies such as Women’s suffrage, the world’s first universal social security system… What a pity the neo-cons tried to change that. Of course, when we talk about ‘long-term thinkers’ we need to be careful: as a Chinese student said to me recently “In comparison with China, the West has no idea what LTO means! The Chinese are certainly LTO, unlike many Asian cultures and are also more ‘Control Nature’ than ‘Nature in Control’ – this makes them very different from the Viet Namese, the Thais and other Buddhists IMHO. Thanks for your elaborate and wide internationl comment. It seems to me that this explains also some differences concerning engaging employees in the different countries that were mentioned. A lot of limiting beliefs, conditions and bias prevent qualified and competent people to get hired for a job. Not surprising that such people, for reasons of lack of self competence e.g. are not encouraged to start up their own business… Just my two cents. I think you’re right in your end statement. Job hopping is not seen as “damaging” to your career in NL as it might be in Belgium. 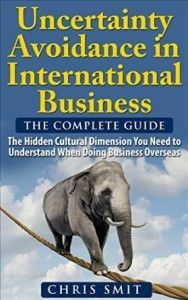 Another cultural aspect that I associate with high uncertainty avoidance is a large, labyrinthine, all-encompassing and cumbersome bureaucracy. This is something you might not notice about another culture until you’ve spent some time there. But having lived in Spain and living now in France (high uncertainty avoidance cultures), I notice the two countries are the same in the way their entire society runs on the need for documents and endless photocopies of documents, even for very simple procedures. This kind of thing really rubs Americans (a low uncertainty avoidance culture) like myself the wrong way. Why is this an aspect of uncertainty avoidant cultures? For several reasons. One is that both Spain and France want everyone in the ‘system’, with the government knowing as much as possible about your personal situation. This allows for even greater measures against uncertainty like social security, universal health insurance, etc. which uncertainty avoidant cultures like to have for pretty obvious reasons–you know you’re covered by the state when anything bad happens. In the USA our system of government identification and major holes in the system of social security/government assistance would be unthinkable in a high uncertainty avoidance country. Think about how you can technically get around in the US without any sort of government-issued photo ID. If you’ve never passed a driver’s test and never asked for a state ID, you don’t have anything and no one forces you to get an ID. In Spain and France an ID is required at all times and everyone must get one automatically past a certain age. Bureaucracy exists in the US too, but it doesn’t permeate everything like it does in high uncertainty avoidance cultures, where people get very nervous when a single document is missing, one that might possibly be needed one day in thirty years; when there is any possibility that you could be lying on one of your documents and therefore need five pieces of supporting documentation for the simplest procedure. To me all this seems to come from a kind of fear of anything going wrong. In the US, bureaucratic procedures go more smoothly because there is the general attitude of: well, if there’s a problem with your application, we’ll call you up and deal with it when it happens. It’s a culture that approaches everything with a “wait and see” attitude, because it knows that it’ll be able to handle any hurdles that arise along the way. Very much agree with your point of view and examples. I also agree with Koen’s observation about how high uncertainty avoidance cultures approach hiring people. Again, I can only draw from my experiences living in the US (low UA) and Spain and France (high UA). But in both Spain and France, there exists a fear of hiring or contracting anyone who might be the least bit unqualified for the position. To ensure as much as possible against any sort of incompetence, you must have the EXACT qualifications listed to land a job in Spain or France. To be hired for a marketing position you MUST have a marketing degree, no exceptions. If a position says you must have three years experience in almost exactly the same kind of position for the job you are seeking, there are no exceptions to that rule. The US is extremely flexible where Spain and France are not. In the US you can technically major in almost anything and still get a job in a pretty different field, provided you have some other kind of experience to make up for having a different degree. Job hiring decisions tend to be made on more nebulous criteria like your personality, work ethic, and the employer’s general sense of how competent you are for the position. This is a risk-taking attitude: the employer accepts that they may be hiring someone who doesn’t really know what they’re doing, while hoping that the new employee may bring some fresh insight to their business/organization. Same as my previous reply to you: Agreed. Thanks for leaving such elaborate comments! So I have a question. What is the Credit Crisis, and how does that relate to United States’ low level on uncertainty avoidance? Your question is easy. The answer a bit more difficult (especially if you want to keep it short. Let me know your thoughts (preferably via the new post). And then I compared the scores that China , Taiwan and Korea have on the uncertainty avoidance, it turns out that China has a comparatively very low score to the other two countries. Is there any reason that we can try to explain this? Forgive my ignorance , but being an Asian , I did think that Asian countries would have more possibilities to have high score on this dimension. For China , in the beginning I tried to think maybe it’s something related to the turning point from communism to capitalism , but this won’t be the case for India or Singapore. Would you please share what you think with me ? Thank you ! Thank you for your comment to this article. Your observations are correct when it comes to comparing China, Taiwan and Korea. The question you ask “Why” this is, is very difficult to answer. Tracing back where cultural difference come from is hard, if not impossible. I hold on more to whether you recognize the differences, and/or whether it is practical; in other words, can you use what you know now, to be more culturally competent. As for your point on “the turning point from communism to capitalism”: Communism, or the imposing thereof, or the transition to capitalism is not related to Uncertainty Avoidance, but more to Power Distance; the first of Hofstede’s dimensions. It is the government of China that imposed communism. And it is the government of China that said “now we’ll turn it into capitalism”. High uncertainty avoidance leads to a demand for certificates. They are often hanged on walls in the office or in the sitting room. I would think that you are partly right. High scoring cultures do have a higher need for certificates, but more so in the form or “Attestations” and ISO certification. They indicate that things can be trusted, are real and that formalities are followed (in the case of ISO norms). However, cultures scoring high on Masculinity (or Process versus Goals) have a greater need for certified achievements, like diploma’s. So called acquired status expressions. Often those can be found hanging on the wall (in the case of Anglo-Saxon countries). In a way you’re right. However, you need to look at how you define “Risk Taking”. Is bungy jumping risk taking? How about driving a car or getting onto an aircraft? The three previous examples are not considered as risk taking but more as “Calculated Risks”. You know that something can happen, but you’re willing to take the risk anyways. In the above case Uncertainty avoidance has no influence on the level of calculated risks people take. It becomes a different story when you’re looking at uncalculated risks. Like starting your own business, innovation, trying new things, bringing new “stuff” to the market.